European Parliament elections are being held on 22-25 May 2014, with voting already under way in some countries across Europe. Our staff (teaming up with EUROPP Blog and Greece@LSE) gives a final look at the national campaigns for each of the South Eastern European countries, highlighting the national polling and the key domestic issues. We ran a live blog commenting on the election results on Friday, 25 May – follow this link. Bulgaria has experienced political instability since 2013, when a widespread protest movement forced the government of Boyko Borisov to resign. The new government which emerged was a fragile coalition between the Bulgarian Socialist Party (BSP) and the Movement for Rights and Freedoms (DPS), which lacks a parliamentary majority (it is firmly supported by 120 out of 240 MPs) and relies on the ultra-nationalist Ataka (Attack) to govern effectively. The European elections will take place in this context, with support polarised between the governing parties and Borisov’s Citizens for European Development of Bulgaria (GERB). Latest update: average of polls 13 May; Media and IMP. Note: The Coalition for Bulgaria is an alliance between several parties: the Bulgarian Socialist Party (BSP), Party of Bulgarian Social Democrats, Agrarian Union “Aleksandar Stamboliyski”, and Movement for Social Humanism. For more information on the other parties see: Citizens for European Development of Bulgaria (GERB); Bulgaria Without Censorship; Movement for Rights and Freedoms; Alternative for Bulgarian Renaissance; Reformist Bloc; Ataka (Attack). The Social Democratic Party of Croatia (SDP), led by the country’s Prime Minister Zoran Milanović, has suffered a substantial drop in popularity in recent months, particularly over the party’s opposition to a proposed referendum on a constitutional amendment to ban gay marriage. However, the SDP have also contributed to their own downfall, with the latest in a long line of problematic decisions being the sacking of a largely popular Finance Minister, Slavko Linić, over allegations of irregularities in tax administration. This was the seventh minister to leave the government since its formation in December 2011, and while Linić has declared he will not make any comments until after the European elections, support for the SDP has nevertheless fallen. The latest prediction bears this out, with the SDP’s coalition currently in second place in the polling behind the right-wing Croatian Democratic Union (HDZ) coalition. At a broader level, there is little mention in the public discourse of the impact the elections might have on Croatian politics, and enthusiasm toward the EU appears to have faded substantially since the country’s accession in 2013. This was apparent in Milanović’s comments in a recent LSE lecture where he declared that “‘we have a united Europe, and it’s great, but it’s enough”. While such down-to-earth remarks are in stark contrast with the flamboyant promises of other politicians in the region, such as in Serbia, it is unclear whether they will be enough to arrest the slide in support the SDP has experienced. Latest update: EP poll conducted by Ipsos Puls 16 May. Note: The Croatian Democratic Union Coalition is composed of four parties, of which the Croatian Democratic Union is the largest. The Kukuriku Coalition contains parties from different parliamentary groups, as a result the vote share shown is for the coalition as a whole, but the seat prediction is split between the parties in each group: the Social Democratic Party of Croatia, which is part of S&D; and the Croatian People’s Party – Liberal Democrats (HNS) and Istrian Democratic Assembly (IDS-DDI), which are part of ALDE. For information on the other parties, see: Croatian Sustainable Development (ORaH); Croatian Labourists – Labour Party; and Alliance for Croatia, which is an alliance of several small right-wing parties. Cyprus goes to the polls a little over a year after a financial crisis that brought the country to its knees. Although it has made a rapid recovery, and it is now expected that the resulting recession will not be as deep or as prolonged as once feared, there is still a lot of anger at the way in which the EU behaved at the time. Eurosceptic sentiment has risen dramatically. This could well have a major impact on turnout. The key things to watch out for will be the extent to which the two main parties – the governing centre-right DISY (EPP) of President Nicos Anastasiades and the opposition communist party AKEL (GUE/NGL) – will be affected by the economic downturn. Usually, they each poll around 30-35 per cent each and in the last election they each took two of the island’s six seats. The other two seats went to the two smaller mainstream parties: DIKO and EDEK (both S&D). Other things to look out for are whether ELAM, a Cypriot affiliate of Greece’s Neo-Nazi Golden Dawn picks up votes. Also, this election will see five Turkish Cypriots standing as candidates for the European Parliament. Given that the government has made it easier for Turkish Cypriots to vote, some have asked whether Cyprus may even elect its first Turkish Cypriot MEP. Although this is highly unlikely, it will nevertheless be interesting to see if many Turkish Cypriots do cross the dividing line to cast a vote. Latest update: EP poll conducted by IMR on 15 May. Note: Several parties are running in coalitions. For more information on the parties, see: Democratic Rally (DISY); Progressive Party of Working People (AKEL); Democratic Party(DIKO); and Movement for Social Democracy EDEK. Greece was the focal point of the Eurozone crisis and debates over the country’s economy and on-going austerity programme have formed the backdrop to the European elections. As Spyros Economides has noted, the electorate is deeply divided between citizens who support the continued austerity and reform programme – who will mainly vote for the centre-right New Democracy party (ND) – and those opposed to the austerity packages, who will mainly support the radical populism of SYRIZA. In the latest prediction, SYRIZA holds a narrow lead in the polling over New Democracy, with the far-right Golden Dawn in third place. A further dynamic in the Greek party system is the anti-establishment politics of parties such as SYRIZA and Golden Dawn which targets the ‘old’ parties who held power prior to the crisis, namely New Democracy and PASOK. The latest party to emerge along these lines is ‘The River‘ (To Potami), which was formed by TV presenter Stavros Theodorakis in February. The party is currently polling around 8 per cent of the vote, which would be good enough for 2 MEPs in the Parliament. Latest update: average of EP polls from 14 – 15 May; Palmos and Alco. Note: PASOK is contesting the elections as part of the ‘Olive Tree’ alliance, which also includes Agreement for the New Greece, Dynamic Greece and the New Reformers. For information on the other parties see: Coalition of the; Radical Left (SYRIZA); New Democracy; Golden Dawn; The River (To Potami); Communist Party of Greece (KKE); Independent Greeks; Democratic Left. In Romania, the Social Democratic Union alliance between Romanian Prime Minister Victor Ponta’s Social Democratic Party (PSD), the Conservative Party (PC), and the National Union for the Progress of Romania (UNPR) has a strong lead in the polling and is likely to receive around half of the country’s total allocation of seats. The elections will take place in the context of political instability and ahead of a contentious Presidential election in November. Following elections in December 2012, Romania was governed by a coalition, the Social Liberal Union (USL), which incorporated the three Social Democratic Union parties alongside the National Liberal Party (PNL). However the PNL left the government in February, forcing a new coalition involving the Democratic Union of Hungarians in Romania (UDMR) to be formed. The elections could therefore have an important impact on party co-operation in the upcoming Presidential election. Latest update: average of EP polls from 10 – 12 May; INSCOP and CSOP. Note: Social Democratic Union (USD) is an alliance of the Social Democratic Party (PSD), the Conservative Party (PC), and the National Union for the Progress of Romania (UNPR). For more information on the other parties see: National Liberal Party (PNL); Democratic Liberal Party (PD-L); Democratic Union of Hungarians in Romania (UDMR); Civic Force (FC); People’s Party – Dan Diaconescu (PP-DD). In recent weeks, the Slovenian political arena has been dominated by Zoran Jankovic’s re-election as leader of Positive Slovenia (PS), at the expense of the country’s Prime Minister, Alenka Bratusek, who subsequently submitted her resignation as PM on 5 May. Bratusek fought hard to avoid an international bailout of Slovenian state-owned banks, and has succeeded in this respect; however, this came at the cost of increased taxation and higher foreign government debt, resulting in a fall in popularity. Jankovic took the opportunity to successfully challenge Bratusek’s leadership at the party’s annual congress, thus provoking her resignation, with national elections expected in July. With such a chaotic lead up to the European elections, it is perhaps not surprising that PS are predicted to have a disappointing result. Indeed, of the current coalition parties, only the Social Democrats are predicted to win a seat. 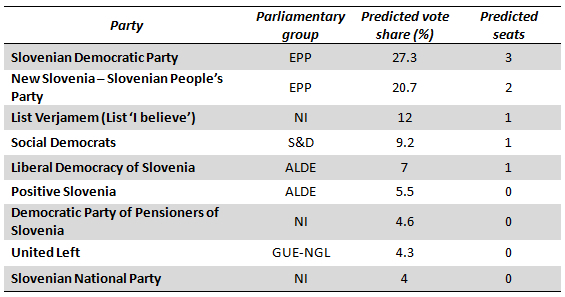 The remaining seats are likely to be shared by Janez Jansa’s Slovenian Democratic Party (SDS), followed by the conservative New Slovenia – Christian People’s Party (NSi) and two minor parties. Latest update: average of EP polls from 10 – 13 May; Ninamedia and Episcenter. For more information on the parties see: Slovenian Democratic Party; New Slovenia – Slovenian People’s Party; Social Democrats; Liberal Democracy of Slovenia; Positive Slovenia; Democratic Party of Pensioners of Slovenia; United Left; Slovenian National Party. This post was written in collaboration with EUROPP Blog at Greece@LSE – see an analysis of all the national campaigns here. This entry was posted in Current affairs, Elections, EP elections and tagged Bulgaria, Croatia, Cyprus, Elections, EP elections, European Parliament, European Union, EUROPP Blog, Greece, Romania, Slovenia, South Eastern Europe. Bookmark the permalink.